The cooking bug got me this last week and I decided to try something new for dinner on Friday. I love pasta and seafood and found a recipe I had printed out years ago for Olive Garden's seafood alfredo. It didn't look intimidating and I decided I was going to make the pasta and the cheese and garlic biscuits that I had made once before. I was pretty nervous once I started cooking the pasta. I had never cooked scallops or shrimp and was worried I would overcook them. 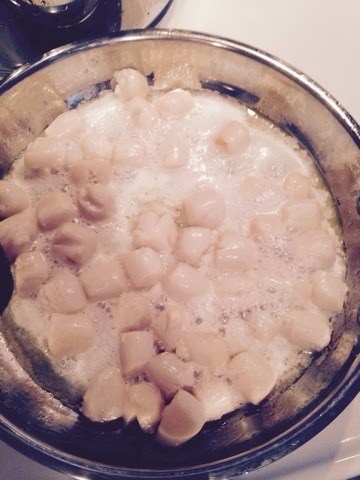 I followed the directions carefully to make sure I didn't end up wasting a pound of scallops. It would have been a tragedy if they had been under/overcooked. Glad to report that it turned out great! Not to toot my own horn but my first bit was a delicious surprise. The Husband reacted the same way and my youngest sister confirmed my success by having three servings of it. The pictures do not do it justice. The lighting in my kitchen is horrible and I just don't have the patience to carry my bowl of food around until I find good lighting. My dream house will for sure have lots of natural light in the kitchen! But since all you have are these sad pictures you will just have to trust me that it was delicious. 1. Pre-heat a skillet on medium-high heat. Add 2 tablespoons olive oil and saute the scallops for about 6 minutes. Stir in the shrimp & cook for an additional 4-5 minutes, or until done. Remove from the pan & set aside. 2. 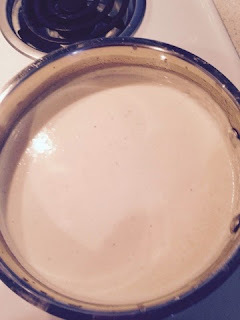 Put remaining two Tbs of olive oil into a saucepan and melt butter at medium-high heat. Add cream, garlic, and pepper and cook for about five minutes. Whisk often. 3. Slowly add the cheeses and continue stirring. Make sure to whisk often. This will take a few minutes to melt all the cheese completely. 4. While the sauce is cooking, boil the noodles according to package instructions. 5. 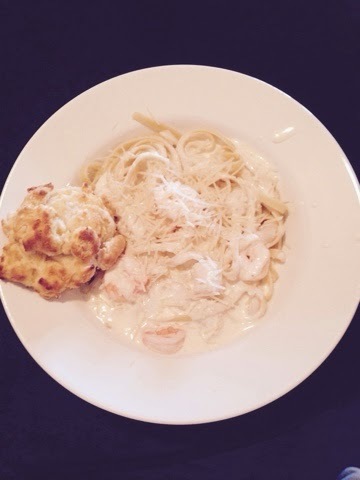 Place pasta on serving plate and combine with seafood and sauce. You can also mix everything together.